The manual's focus is on the development of your students' speaking skills and can supplement any method. 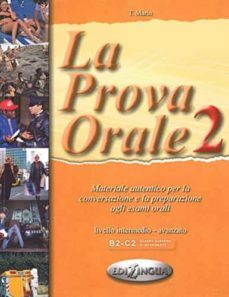 Color photographs and a variety of teaching techniques, which draw on useful words, phrases and many questions assure that the learner is constantly motivated to converse in Italian. It contains authentic material for conversation and preparation of the oral exam. Also included are glossaries with vocabulary and two brief tests. An effective two-level method that will prepare the students for the oral exams of the Universities of Siena or Perugia (CILS1-4, CELI 1-5).